Professor Mohammed Tikly is Professor and Academic Head of the Division of Rheumatology, Department of Internal Medicine, University of the Witwatersrand, Johannesburg. He is based at the Chris Hani Baragwanath Academic Hospital in Soweto. He completed his undergraduate medical training at Wits Medical School, Johannesburg, and registrar training in Internal Medicine at Baragwanath Hospital during which time he obtained his MMed degree. He subsequently did his Rheumatology training in Edinburgh, Scotland, under Professor George Nuki. While in the UK he obtained the MRCP (UK) diploma and in 2000 was elected Fellow of both the Edinburgh and London Royal Colleges of Physicians. 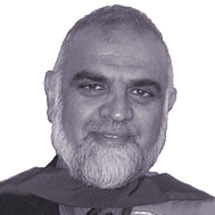 In 2002, Mohammed graduated with a PhD at Wits for his research entitled 'Aspects of the aetiopathogenesis of systemic sclerosis'. Professor Tikly is actively involved in training and education in sub-Saharan Africa. He is a past president of the South African Rheumatism and Arthritis Association and an executive member of the African League of Associations of Rheumatology. His research interests are the genetics and clinical outcomes of common rheumatic diseases in South Africa.